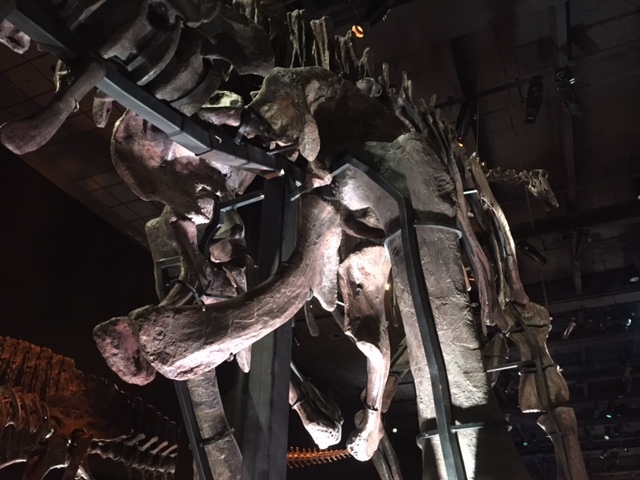 Generally when people think of dinosaurs, most envision large sauropods. But I bet most of you readers out there have probably never heard of the Othnielosaurus, which represents the whole mysterious family of Ornithopods. 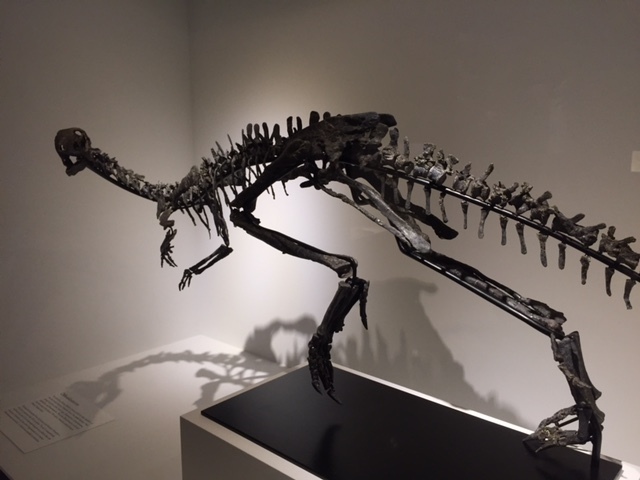 This smallish dinosaur was just a little bigger than a dog and lived in a world of giants like the Apatosaurus or Diplodocus, whose feet this little guy may have scampered under while foraging for food. This is the first Othnielosaurus found with a well preserved skull. 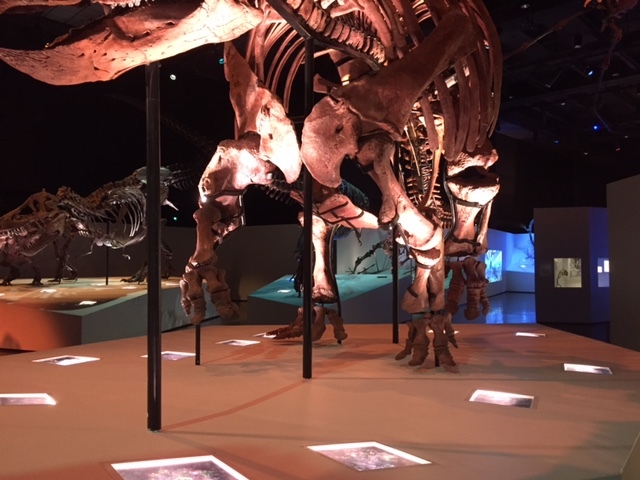 In fact, the skull is so well preserved that it is currently being studied by paleontologists to shed light on the lifestyle of this Cretaceous creature. Right now the big question is whether this animal was strictly an herbivore or if it was an omnivore eating whatever it could find. For now, the skeleton displayed in our hall has a 3D printed version of its skull, but the original will be reunited with the body after the research is complete. 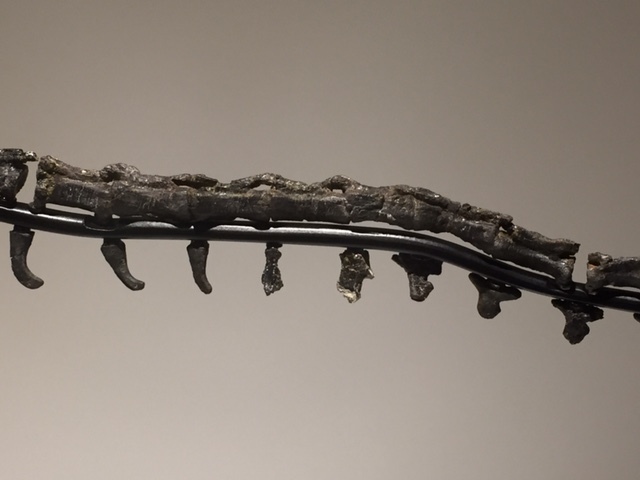 This is the first ever dinosaur mounted using magnets! Notice in the photos below how the bones are held in place by chunky steel armatures and supported by heavy beams. Although hidden as skillfully as possible, these supports are readily apparent. Right now, this is the only way to display the fossils in three dimensions, without drilling into them and altering their scientific value. But our new Othnielosuarus is blazing the trail to a better method of display. 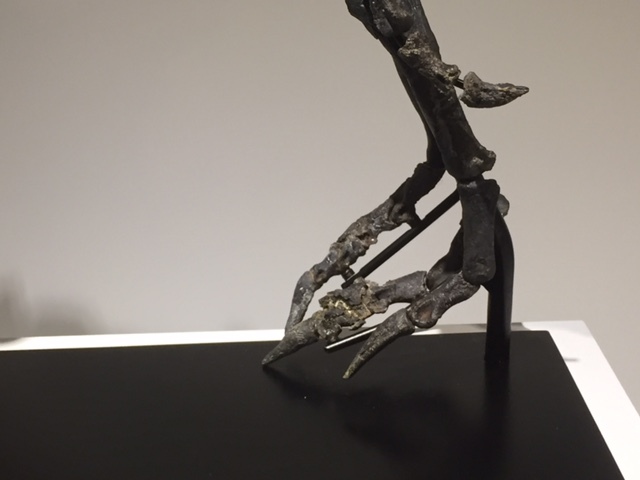 Magnets have been carefully glued to the bones and skillfully set on a metal armature. Although a steel “skeleton” is still present, there is no metal wrapped around the bone. And besides the better visual quality provided by this method, the new system also allows a much more dynamic posture to be obtained with the mount. Beyond the rarity of the specimen and the uniqueness of the mount, there are mysterious details to the skeleton that will keeps paleo-fans intrigued. Take a look at these sections of the tail and foot: Some of the bones have been crushed! It’s not for sure yet if this was caused during the skeleton’s oppressive stay under the earth or if these are injuries occurred during life, but there is a chance that these may represent bones that have healed after being broken. If these were injuries, you can tell that they healed because the bones have fused together, this often happens during the healing process when an injured bone tries to repair itself by producing more bone. Take another look at those pictures of the tail and foot. Notice anything besides the crushed bones? Some of the bones are pyritized! What is pyritization? That’s when pyrite (aka “fool’s gold”) forms on a fossil. Look again and you may notice a slight golden luster to some areas of the fossils. Previous Post Get Ready For Trains Over Texas!